This week has been a little quieter than my other weeks, but that is ok. I haven't done any deep cleaning this week because we are planning to have a bee keeper come and remove a bee hive from our old shed, then Karl will tear that down and we are going to get a dumpster out here and we can throw away stuff then. 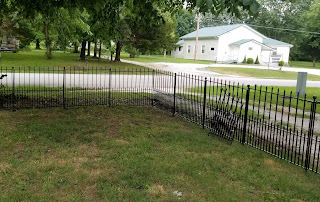 We still have fence stuff in our yard and I want to clean my closet. Karl worked over the weekend on the front yard fence. 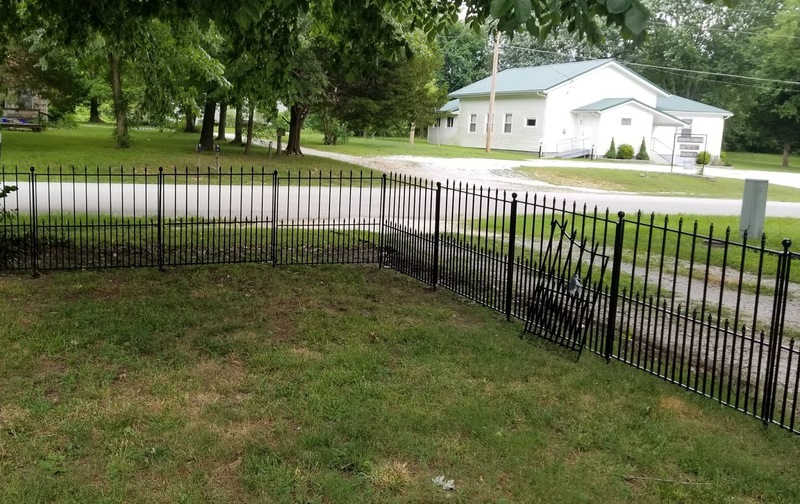 It is more of a black steel fence, then the rest is privacy fence. It is done now and it looks nice...except we need to clean up our yard from him building it. We will get there. Tuesday we had Pella windows come out and we are going to get a new living room picture window. It is the only window that is not double paned in our house. We have replaced them all. We have an old house. I am hoping it will help in the winter keeping our house warm. In the summer too, but I notice it the most in the winter. Wednesday was the 1 year Anniversary of my dad passing away, so Josh and I took my mom shopping. We went to DSW shoe store, Petco, Home Goods, Ulta, TJ Maxx, Dillards, Cato and we ate at Chick-fil-a. I got the dogs some treats at Petco and I got two new t-shirts at Cato. They are super soft t-shirts. Thursday I took Josh to the dentist to start with his cavity fillings. This is 1 of 3 appointments. He had 6 cavities. He is going to fall off our dental insurance in August, so we want to get the dental stuff taken care of. I have also been writing in a pen and paper journal this week. I wanted to journal about last year and about our doctor appointments and how we are feeling. I am caught up, so I am happy to have all of that written down. Josh has good and bad days with his depression and anxiety. He seemed at first to be doing so good with his new medicine, but the past two days, he has been down. My medicine still seems to give me energy on most days...not all, I still have days where I am really tired, but I am doing better. I also think my hair is not falling out as much. That is good! That is also a side effect of hypothyroidism. There are so many symptoms and when I looked up symptoms of hypothyroidism, I have almost all of them. I am hoping for improvement. It says to give it several weeks to start working. I go back to the doctor next week. I do not have anything planned until Monday, so I am blogging now. Have a beautiful weekend! Hi Lori, I'm glad you are doing better and still praying for both you and Josh. Medication is known for hair loss. I was taking a blood pressure pill awhile back and was losing a lot of hair thank goodness I had thick hair to start off with. It took 2 different kinds of medication to stop the loss. I like your new fence too. Have a day of blessings ahead dear friend. Hi Lori. It looks like you are making great progress on your home improvements. There are a few major things we will be doing to our house in the coming years, but for now we are focusing on the small projects. Eventually we want to get gutters. They are optional down here since houses don't have basements, but I still think they are a good idea. But that will be a big expense, so it will wait until next year most likely. I ordered new locks for our doors and they should be here Monday. I will feel better knowing that we have all the keys to the locks. The lady who lived in our house before us has a big family, so goodness only knows how many keys are still floating around out there. She only left us three. I hope Josh gets to feeling better soon. Meds do take some time to kick in. In the meantime, if you can, encourage him to get some exercise. The natural endorphins should help some, plus getting out in nature can be therapeutic. I hope your meds kick in soon, too. Hi Lori, You have a big yard. Looks like there is a lot of space between houses there? We are in a city where every house is next to another. We are not in an older neighborhood and there is more space on either side of the house so you don't feel your neighbor is right there. But you would not know it with all the dogs. I hope Josh feels better soon. Maybe he can get some counseling? It helped me. I hope your meds kick in soon. Both my sisters have the same thyroid condition. I lost hair when I was low iron and when I went into menopause. Seems to have slowed down a bit. I just updated my blog, finally. Life can be busy with 4 grand kids! Have a great weekend!